The organizational principles of Shigeo Shingo have been the foundation of an international revolution towards enterprise excellence. His efforts with the Toyota Production System transformed productivity, quality, and customer focus. The Shingo Model is not an additional program or another initiative to implement; rather, it introduces Shingo Guiding Principles on which to anchor your current initiatives and to fill the gaps in your efforts towards ideal results and enterprise excellence. 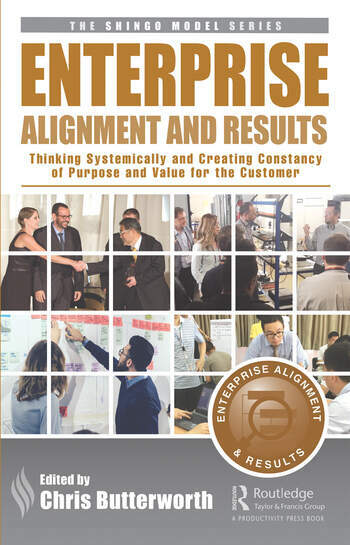 This book introduces the concept of "enterprise alignment," which is founded on the principles of "create consistency of purpose," "think systemically," and "create value for the customer." Chris Butterworth has been with S A Partners for nearly twenty years. Prior to this, he had many years’ experience of operating at senior management positions in several multinational organizations, including JCB, Jaguar, and Corus. He was part of the team that set up and ran one of the earliest Lean factories in the UK in the early 1990s. He was the overall program manager for the work with Cogent Power described in the Shingo Publication recipient book Staying Lean, and has spoken on the topic of "Lean Thinking" at many international conferences. He has published papers on Lean Thinking in various journals and in 2017 co-authored the widely acclaimed book 4+1 Embedding a Culture of Continuous Improvement in Financial Services, which is based on a case study from a Shingo Medallion recipient team at the Commonwealth Bank of Australia, as well as the approach taken at the Bank of New York Mellon. He facilitates Lean Thinking and Shingo workshops for executive management teams globally and is a certified Shingo Institute facilitator and examiner. In 2014, he was honored to be awarded Best New Speaker of the Year (TEC: The Executive Connection) for his executive talk on Lean Thinking. Chris lives in Australia and when he is not on the beach or walking the coast paths, he spends his time writing and learning about continuous improvement from all the people he has the pleasure of meeting in his job.